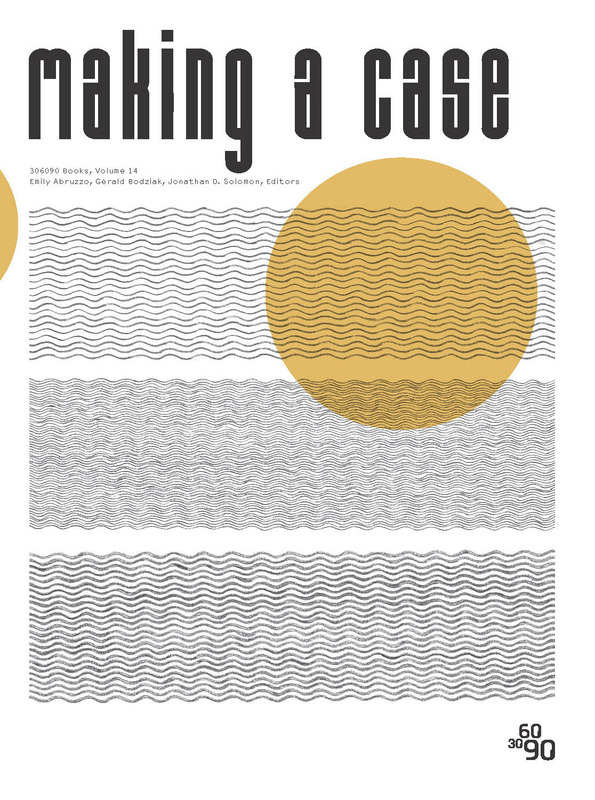 Graham Foundation > Grantees > 306090 Inc.
Cover of 306090, Volume 14: Making a Case, Emily Abruzzo, Gerald Bodziak, Jonathan D. Solomon, editors, 2011. 306090 will publish two volumes of the architecture journal in 2011 and 2012. Coinciding with a shift in the cultural context of the practice of architecture over the decade since 306090's founding in 2001, these two volumes adapt our publication model to address the position of architecture relative to changing economic, political, and environmental challenges that face the discipline in the coming decade. Volumes 14 and 15 are leaner with fewer contributors, though more dense, in terms of design-based content, than previous issues. Each volume addresses architectural themes directly linked to developments in contemporary culture. Like previous projects, these volumes organize the work of an ideologically, geographically, and generationally diverse range of contributors, creating both a record of current thought around a given topic and a critical discourse between viewpoints. Jonathan D. Solomon, coeditor of 306090 Books, has taught design at the City College of New York and at the University at Buffalo, where he was a Banham Fellow. He is currently acting head of the Department of Architecture at the University of Hong Kong. His design work has won awards in the United States and in Hong Kong. His essays and criticism have appeared in Log (New York), Footprint (Delft), Urban China (Beijing), and other publications. He is the author of Pamphlet Architecture 26: 13 Projects for the Sheridan Expressway (Princeton Architectural Press, 2004). Solomon is a licensed architect in Illinois and an architect member of the American Institute of Architects (AIA). Emily Abruzzo, coeditor of 306090 Books, is a writer and licensed architect, as well as an LEED-accredited professional. Experienced in architectural, landscape, and interior design, she has worked with Peter Eisenman, SHoP, and LTL Architects, among others. Abruzzo received her BA from Columbia University and her MArch from Princeton University. While at Princeton, she also earned a certificate in media and modernity, and was a research affiliate at the Andrew Mellon Center for Arts and Cultural Policy Studies. She has been a lecturer and guest critic at numerous institutions and is currently an instructor at Parsons, the New School for Design. Gerald Bodziak, coeditor for 306090 Books, Volume 14, is a licensed architect and LEED-accredited professional. He received his BS in architecture from the University of Michigan and his MArch from Princeton University. His professional work includes extensive experience in large public projects engaged with the arts, educational institutions, and private residences. Bodziak has been a guest critic at the University of Michigan; Yale University; the City College of New York; and Parsons, the New School for Design. He was an editor for the University of Michigan's architecture journal Dimensions, and was an assistant instructor at Princeton University. Founded in 2001, 306090, Inc. is a nonprofit arts stewardship organization that supports architectural professionals and design students by organizing publications and events geared towards fostering a community of ideas and exchange within the field of design. 306090's most recent book Sustain and Develop includes a geographically and ideologically diverse range of over fifty individual contributors.